Dr Tiopira McDowell receives his early career teaching excellence award from Professor Robert Greenberg. As part of our Mataariki celebrations, the Faculty of Arts gathered at Waipapa Marae last month to honour effective and innovative teaching. Ella Arbury was recognised for her excellence as a graduate teaching assistant. Professor Jonathan Scott nominated Ella for this award based on her tutoring for HISTORY 103 Global History. He says that "in the classroom Ella is an unusually effective teacher hugely committed to the learning outcomes of her students. Her tutorials are meticulously prepared and structured with the goal of instilling in students the confidence, engagement and knowledge to equip them to take ownership of their education." Both Dr Stephen Noakes and Dr Tiopira McDowell were recognised for early career teaching excellence. Stephen has a joint appointment in Politics and International Relations and Asian Studies. Partly because of his joint appointment but also because of his generosity and collegiality, Stephen has taught in a dazzling array of courses across the faculty, from his own research area of Chinese politics, to Asian religion, political economy, and research methods for the social sciences. Associate Professor Kathy Smits noted that for Stephen, "university teaching involves more than just imparting knowledge and inspiring students to learn… it's about the broader personal development of students as thinkers, citizens and emerging professionals". Tiopira has been instrumental over the last few years in delivering MĀORI 130/G Te Ao Māori: The Māori World. His primary goals in this course are to empower Māori students, by giving them the tools to understand a Māori worldview; and for Pakeha and other students to afford them an honest insight into the Māori world, in a manner that is accessible, welcoming and insightful, challenging them without being threatening. 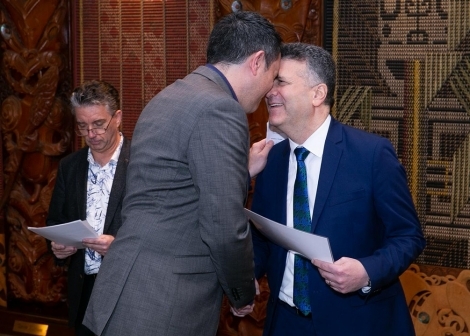 He says that "Māori epistemologies must always be prioritised in the course, however, if we can also speak to students at their level, in their language, in ways that they understand, we can open up their hearts and minds to the Māori world". Professor Margaret Mutu says that Tiopira is "a joy to have in our school and richly deserves recognition for his outstanding teaching performance". Dr Louisa Buckingham of Applied Linguistics and Language Teaching was given the leadership in teaching and learning award for 2018. The leadership award recognises aspects such as innovation in the classroom and in the use of technology as a teaching tool, as well as the impact of the winner's teaching activities beyond the classroom by influencing practice elsewhere in the discipline or School, or indeed beyond this institution. Louisa’s teaching is full of examples of innovation and the wider influence of her ideas. Louisa has had a central role in delivering the core course for the new Bachelor of Global Studies for the first time. Professor Martin East said that he was "immediately struck by Louisa's evident enthusiasm to make her component of the course a positive and enriching experience for students. [Her] lectures … brought intercultural communication alive for the students as she interwove her own research with personal anecdote." Louisa goes to great lengths to help her graduate students prepare conference presentations, and works with them wherever possible on collaborative publications, helping new and emerging researchers to get their first steps on the academic pathway. She has also published on her approach to teaching and learning. Associate Professor James Oleson was recognised for his sustained excellence in teaching. James has had a colourful career path, with spells in the US Navy nuclear propulsion programme and as a fellow of the US Supreme Court before joining us to teach and research in Criminology. Associate Professor Tamasailau Suaalii-Sauni says that it is "abundantly clear" that James has "mastered the art of balancing the need for creativity in teaching theory with the need to give proper attention to student learning, while at the same time remaining positive and collegial in [his] approach to developing pedagogical leadership". James says that teaching can be "a life-changing art". "Every lecture is — or should be — a keynote address, approached with the same level of care and the same measure of pride. Indeed, all of the boundaries between research and teaching are far more fluid than we admit. My teaching is research: it is the laboratory in which I develop new ideas and test them against evidence. More than a dozen of my articles were born in the classroom. Others were created with postgraduates or summer scholars as co-authors. My research is teaching: it is how, both directly (by being read) and indirectly (by shaping the arguments of other scholars, as a citation), I might reach the imagination of students who are divided from me by gulfs of time and space." "While I am not sure that I have the right answers, I feel like — increasingly — I am getting the questions right."